team names in over 1,000 organized lists. From funny names to ANY teams name. A list of the best, most clever, Funny Team Names we have created. Are you frustrated, searching for team names that would creatively describe your recreational sports team or fantasy league team? 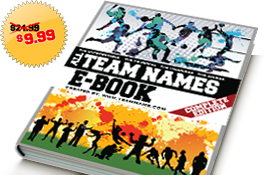 At TeamName.com, we offer 16 volumes of Team Name E-Books that list over 28,000 creative team names! No other website offers even a fraction of the team ideas we do. Why take the gamble of spending hours of time searching for so-called "free" ideas and risk nothing to show for it? When you purchase our Team Name E-Books, you will have tons of ideas, all in one easy-to-read place. You can either select a team name from our enormous list, or be inspired to come up with a creative team name of your own. TeamName.com makes choosing team name ideas easy and fun for you and your teammates! You can purchase one of our single editions for between $5.99 - $7.99. Or, for only $9.99, you can download our complete 16 volume edition which retails for $88.86. That's a HUGE savings of $78.87!!! Purchase your COMPLETE All Team Names E-Book today and get started on the road to choosing creative team names for your team or league! Example : The Football Team Names E-Book has a list called Flag Football Team Names with Flag Football Team Name Ideas. Another list is called Touch Football Team Names with Touch Football Team Name Ideas. Instantly download our FREE test version of our complete edition ebook today. Note: No team name ideas are included. 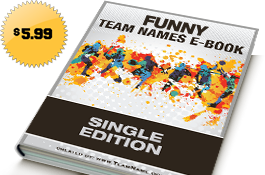 Our Complete Edition Team Names eBook includes all the team name lists from our 15 Single Edition Team Name eBooks + our Miscellaneous Team Names eBook. Our Single Edition Team Name eBooks (Vols.1-15) are the most searched for team name lists. Our Miscellaneous Team Name eBook (Vol.16) includes every other team name list you can think of for any kind of team. Add YOUR Team Name Idea !